Summary: While there is a lot of talk of a “flood” of refugees to the EU or a “migrant crisis” the numbers involved are pretty small compared to the population, size and wealth of the EU – around 0.6% of the existing EU population in 2015 for instance. (This figure includes all migrants estimated by the EU border force Frontex to have entered undetected, and of all nationalities). More a growing trickle than a flood. The proportion of these coming to the UK is even smaller as the UK gets less than 5% of asylum applications to EU countries. Ninety-five per cent of Syrian refugees are in Syria and neighbouring countries. The real crisis is for countries like Lebanon, Jordan and Turkey. Jordan, for instance, a country the size of Cornwall and much poorer than the UK , has about 1.2 million Syrians, an increase in its population since 2011 of 25%. 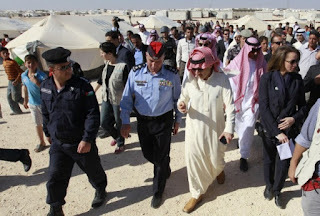 The widespread reports that the richer Arab Gulf states have taken in no Syrians are also false. 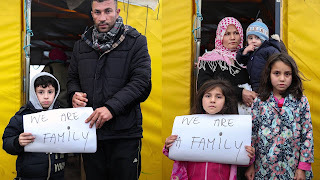 In fact they have taken in about 1.3 million Syrians and in Saudi’s case given them rights to free education and healthcare, but as they are not signatories to the 1951 UN refugee convention, none are reported in UN statistics as refugees. Since Saudi for instance has an extreme version of Sharia law, and oppresses non-Sunni Muslims, many Syrian refugees – who include Christians, Shia, Alawites and secular or moderate Sunnis, as well as non-Arab Kurds, will not want to live there either. 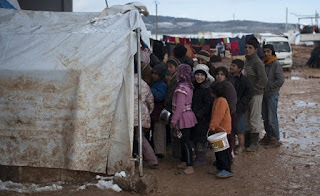 Many of the Syrian refugees in countries bordering Syria are receiving no food aid or medical treatment or education for their children, because wealthier countries have not donated enough to the UN to pay for this. The £1.3 billion over 4 years that the British government boasts about having given to refugees is about £400 million a year out of annual public spending of around £700 billion. It is only “generous” compared to the even smaller amounts given by other countries. Its latest pledge only increases this to around £500 million a year (around 0.07% of the UK’s annual public spending). 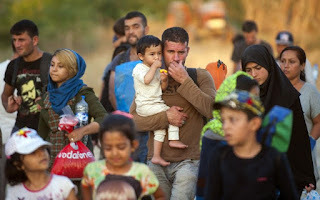 Unless EU governments , the US and the Gulf states donate a lot more money to the UN to feed Syrian refugees , there really will be a flood of them into Europe soon – especially with the governments of countries neighbouring Syria having started deportations of Syrians, and the Turkish government’s restarting of its war with Turkish Kurdish separatists, which makes Turkey even less safe for Syrian Kurd refugees. 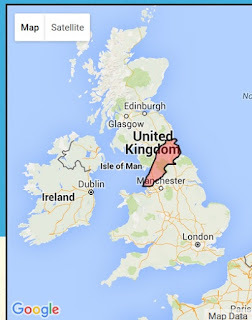 A flood of migrants and refugees to the EU and UK? Only 5% of Syrian refugees have been taken in so far by countries outside the Middle East. The other 95% are in Syria itself (about 18 million internally displace people forced out of their homes but still somewhere in Syria) or refugees in refugee camps in neighbouring countries. The numbers granted refugee status in neighbouring countries are over 2.5 million granted refugee status in Turkey, over 1 million in Lebanon, about 600, 000 in Jordan , 250,000 in Iraq (which has a civil war itself) and 100,000 in Egypt (a military dictatorship) . However the total numbers of Syrian refugees in these countries are higher, as many have not been granted formal refugee status. Lebanon and Jordan are small and fairly poor countries. (1). Lebanon alone has taken in probably more Syrian refugees than the entire EU combined at 1.1 million (or 1.2 million including those not granted refugee status), a 25% increase on its pre-Syrian civil war population of 4.3 million (which already included 450,000 Palestinian refugees). The EU by comparison got asylum claims from a bit over 200,000 Syrians in 2015 – or just 0.04% of its 504 million population, or 270,000 total since 2011, around 0.05% of its 504.5 million population on the first day of 2011. Of course there were other migrants and asylum seekers from other countries too. The European border agency Frontex estimates the total number of migrants coming to the EU illegally in 2015 was around 1.5 million, including those likely to have avoided border controls. The numbers who enter legally each year have been similar from 2010 at about 1.4 to 1.5 million a year. So for 2015 the total number of legal and illegal migrants would be around 3 million, or a 0.6% increase in the EU’s population if all were allowed to stay (which they will not be as, while applications may take a long time to process, many applications are rejected each year and around 40% of rejections result in deportation in the same year as they are rejected) (2) – (5). These figures don’t include the number of non-EU nationals who leave the EU (emigrate from it) every year, from around 700,000 in 2010 to over 800,000 in 2013. That would make the overall growth of non-EU national population in the EU about 2.5 million in 2015, or 10 million over 4 years maximum or around 0.5% per year, or 2% over 4 years (again likely an over-estimate) (6). So the total increase in the EU’s population from immigration from outside the EU is not so much the “flood” the media often talk of as a rapidly growing trickle relative to the size of the lake it’s flowing into. And of course immigration and emigration aren’t the only factors affecting population growth. Birth and death rates also affect it. Looking at total population growth for all the countries that are now EU members since 1960 there has not been any significant increase in the rate of population growth. Birth rates have fallen significantly over that time, while people are also living longer due to improved living standards and medical care. The result is a growing population, but with a growing percentage of elderly people (7). Without either immigration (with immigrants being younger on average) or other measures to increase the birth rate (e.g the 35 hour week tried in France), or both, we may end up with not enough people of working age to pay the taxes to fund healthcare and pensions for pensioners. But ever increasing population results in increasing pollution, deforestation and environmental damage, including climate change. This is a difficult circle to square. The rate of population growth in the EU has actually been falling for decades though and is considerably lower than it was in the 1960s. Are the wealthiest Arab states refusing to take in any Syrian refugees? The Gulf states – Sunni ‘monarchies’ (dictatorships) allied to the US and who are funding and arming many of the Syrian Jihadist Sunni rebels (including Al Nusrah, the Syrian wing of Al Qa’ida) are refusing to take in any Syrians as refugees, as they are not signatories to the 1951 Refugee convention. However some Syrian refugees have been given residency permits to live in Saudi and granted free education and healthcare (the Saudi government claim over 100,000 though this is not an independently verified figure) (8) – (9). World Bank figures gave the total for all the Gulf monarchies as over 1.3 million Syrians living in them in 2013 , 1 million in Saudi, but the UNHCR figure in 2015 was just 500,000, possibly due to definitions of who was being counted (10). However even Saudi citizens have no real rights not to be imprisoned or executed without fair trial. Immigrants working in Saudi are exploited ruthlessly. And Saudi Arabia has an extreme version of Sharia law based on the Wahhabi sect of Sunni Islam. Syrian refugees include Christians, Alawites and Shia, all of who face persecution in Saudi, along with moderate and secular Muslims who do not want to live under Sharia law. So many refugees would rather avoid Saudi Arabia and other dictatorships with religious laws. The UK’s population has grown steadily too, around a 20% increase in the last 50 years. The rate of increase has gone up and down over that period, but is currently higher than at any point since the 1950s (11). The UK, with over 10% of the EU’s population, and one of the richest countries in it, gets less than 5% of asylum applications for refugee status from people who are not citizens of any EU country. So the people at Calais are not a flood either, but an even smaller trickle. For instance in the second quarter of 2015 the UK got just 3.5% of applications to EU countries. In the third quarter it got just 2.86% (12). And that trickle is not higher than ever before either – the number of asylum applications in the UK in 2014 was about the same number as in 1990. 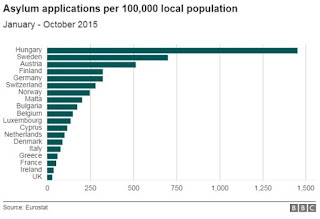 And overall about 52% of asylum applications processed in 2014 in the UK were refused (13) – (14). The UK actually gets very few asylum applications relative to it’s size and wealth – one of the lowest rates in the EU relative to our population. The EU and UK are not suffering a refugee “flood” or “crisis”, but manageable numbers both in terms of their exsiting population, their land area and their wealth. 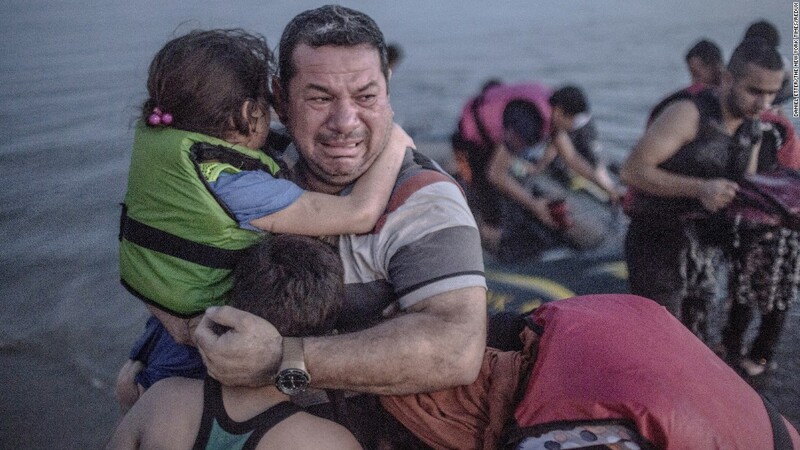 The real refugee crisis is in Syria and for its neighbours. But if the wealthier governments continue to fail to provide enough money to feed and house refugees in countries neighbouring Syria, there may soon be a real flood. The UK’s supposedly “generous” aid to Syrian refugees in the Middle East comes to about £1.1 billion over 4 years since the Syrian civil war began, or a bit under £300 million a year, out of annual public spending of around £700 billion (thousand million) a year. The fact that other EU governments have given even less is nothing to boast about. Even Cameron’s latest pledge to increase it to around £510 million a year from the UK and ask other EU countries to increase similarly is far too little. It amounts to under 0.07% of the UK’s annual public spending of over £700 billion a year (20) – (22).